Discussion in 'Java Update' started by Joe, 23/3/19. Everyone knows what gzip is. It's the GNU ZIP or GZIP for short. ZIP was the development of PKWARE and based on the LZ77 and LZ78 Algorithm. ZIP wasn't free in the 80s and computers were usually in short with space. Hence ZIP was the most desirable software to compress data in order to save space on the disk. Either to pay for the fee-based ZIP Tool, or to develop for yourself your own ZIP-similar Software-tool. Jean-loup Gailly and Mark Adler took the challenge to heart and developed the gzip -exactly as the Unix philosophy: "Do One Thing and Do It Well". It's the GNU ZIP Project. The line "Accept-Encoding: gzip, deflate, sdch" says it all: without gzip the web will be snailed down dramatically and then stands still... like the traffic in LA or in Saigon. JAVA, for example, provides the ZIP APIs as standard in the package java.util.zip. Instead of googling for a free ZIP tool why you, an IT developer, won't try to build yourself a ZIPPING tool? With the available JAVA APIs it's a piece of cake to design a fancy ZIP or GZIP app and to impress your friends. However, gzip was designed to only compress files, not directories. Why so? It's because of the patent problems with PKWARE. And that's the real challenge for an IT man like YOU: 2 apps that base on zip and gzip technology and work as exactly as any ZIP-tool does. Well, I show you how to develop two fancy apps that look exactly the same, but the one works with ZIP APIs and the other with GZIP APIs. JAVA GUI is either SWING or JFX. SWING is fine, and popular among the oldies. JFX is more modern and is beloved by the newbies. Taste is usually individual and non-discussable. However, JavaFX offers the developers more features and possibilities than SWING: styling, coloring, animation and shapes. Further one can "follow" the trend "MVC" (Model-View-Controller) without any problem. In my blog here I won't do that because the source of each app is less than 500 lines and there's no reason to complicate the work with "MVC". However, the JFX apps (ZIP.java and JZIP.java) are implemented as the lightweight MVC apps which let its users modify the Cascading Style Sheets file css.css to suit their personal "taste". create: create a (J)ZIP file with the selected files (with abs. path). There are two options for a zip/jzip creation: the zip/jzip must be either created or partially replaced/appended with the selected files. 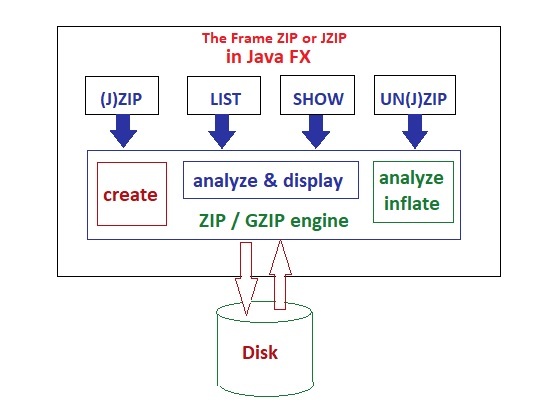 analyze & display: The LIST or SHOW option analyzes the selected zip/jzip file for its validity and lists all zipped/jzipped entries (LIST). For SHOW: if an entry is selected (left pane) its content will be displayed on the right pane. 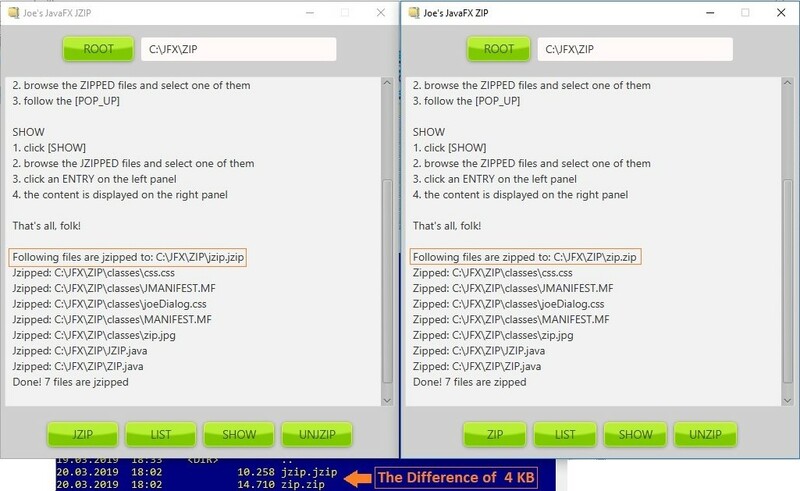 analyze & inflate: UNZIP/UNJZIP checks firstly for the zip/jzip validity, then shows an entry-list for UNZIP/UNJZIP. Only the selected entries are inflated and created in the selected ROOT directory (incl. their path). If nothing was selected and UNZIP/UNJZIP button was pressed all entries are selected for UNZIP/UNJZIP. The ZIP engine uses all standard APIs of the java.util.zip package: ZipInputStream, ZipOutputStream and ZipEntry. The JZIP engine uses only TWO standard APIs of the java.util.zip package: GZIPInputStream, GZIPOutputStream. Instead of ZipEntry JZIP engine provides its own methods (joe's propriety) to sort out the JZIP-Entries and their contents: listEntry(), entryName(), nextEntry(), rawContent(), rawEntry(). CONCLUSION: jzip (with gzip) is better than zip. Because I don't have WinRAR (and don't want to license it) I don't know whether rar is better (or worse) than this jzip. Whatever the outcome is jzip is good enough for my daily work. BUT this BLOG tells you more about the "power" of gzip versus rar and all the other compression techniques. Nevertheless the implementation decides the outcome of the using compression algorithm. Note: the zipped result of ZIP.java is compatible with all commercial ZIP tools. move to the directory classes and run the jar cmd (see the followings). finally you can run java -jar jzip.jar and see how the content of jzip.jzip looks like. That's all, folk! Enjoy the JZIP app or the ZIP.